You've probably heard of front lawns being filled with flamingos or trees getting toilet-papered. But one Dallas family is dealing with a different kind of prank. The Hale family woke up Christmas morning to more than a dozen bikes parked in their front yard. They say it was a prank by a family friend who is also a comedian. “I guess it’s called getting biked,” said 14-year-old Ethan Hale. The bikes are owned by the bike-share business LimeBike. Riders can, and do, leave them anywhere. But never anything like this. Ethan first noticed the bikes Christmas morning when he stepped outside to play with his new drone. “My son came outside to use one of his presents and immediately came back in and was like you're not going to believe what's in the yard,” Ethan’s father, Michael, recalled. 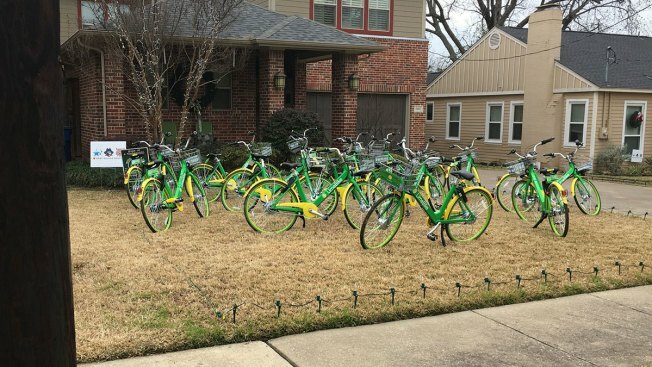 “I was really confused and kind of laughing at the same time ‘cause there were 14 bikes in our yard, LimeBikes,” said Ethan’s 12-year-old sister Lyla. It's unclear exactly how the bikes got here. After three days, the Hales say they are ready for them to go. "We're kind of hoping LimeBike will get them, retrieve them but I don't know," mom Sarah Hale said with laughter. NBC 5 emailed LimeBike and within an hour, a crew showed up to retrieve the bikes. In a statement, a LimeBike spokesperson said, “Sabotaging the bike-share ecosystem is illegal and morally wrong. It is an attack on the overall transportation system in Dallas. Sometimes, these pranks put the lives of our LimeBike operations crew and our city partners in danger when we retrieve the illegally placed bikes."